Everything described and reviewed here was purchased with personal funds, and no keyboard manufacturers or retailers were involved in the making of this review. I spend my days writing and typing, and good keyboard ergonomics are key to that. I’ve talked about Ergonomic Keyboards before, but I’d like to very briefly review three keyboards I’ve tried since, the Kinesis Advantage, the Matias Ergo pro, and the Kinesis Freestyle 2. 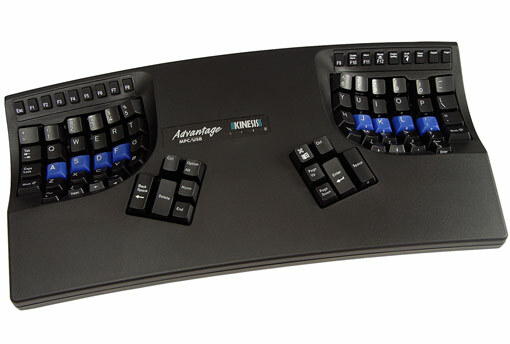 The Kinesis Advantage is a high-end ergonomic keyboard, with mechanical keyswitches, as well as contouring and sculpting to ensure that your hands are in the best, more comfortable position. I found one, cheap, on Craigslist in my area, and used it for about a month. This is a spectacularly well-made device. The keyswitches felt great, the hardware worked well, and it’s true, your hands feel great using it. The onboard macro function works well, too. Because of all that, I really wanted to like this keyboard. But I didn’t. The biggest issue is the shape. This keyboard is between 2 and 3 inches tall, to make room for the sculpting. This means that it’ll never work with a rollermouse, my input device of choice, and it means that in order for the keyboard to be at the right height for your lower arms to be level, your desk needs to be very low. For me (with my long upper arms) this simply wasn’t possible. Maybe if the desk were exceptionally thin, or milled out to provide a place for the keyboard to rest, it’d work. But for me, it didn’t. Also a problem is the learning curve. Because this is very different, keystrokes become unfamiliar, and some become altogether impossible. You’ll need to adjust your hands and brain to this keyboard, rather than the other way around. If it’s perfect for you in every other way, you’ll make do. But I didn’t. Finally, the cost. This is a $300 keyboard (although I got mine for less than 1/3 of that on Craigslist). At that price, you need to need this keyboard. And I didn’t. So, it went back on Craigslist, and sold within a month, and I went back to the Freestyle I. The Advantage was comfortable for sure, but too tall and deep for me to bother with the learning curve. Know your desk space and input devices before you take the plunge. This is a split keyboard with mechanical keyswitches, designed by Matias to be the most ergonomic mechanical keyboard on the market. I pre-ordered this because I loved my Kinesis Freestyle and Freestyle 2 split keyboards, but missed the precision of mechanical keys. Like all split keyboards, you can position the halves however you’d like, at a comfortable split for you and your needs (and you can set a glass of tea between the halves). The keys feel fine, although they require more force than the Kinesis Advantage or Freestyle. It was also solidly built, and the mechanical keys weren’t too clicky and loud. I loved the quick-disconnect USB cable in the back, N-Key Rollover, the expandable cable connecting the halves, and the layout (although 6 being on the right side took some getting used to). Unfortunately, this keyboard, although excellently designed, suffered terribly from a few flaws. This, I could forgive. But second, the keys required a pretty heavy pressure, and just didn’t feel that great to type on. 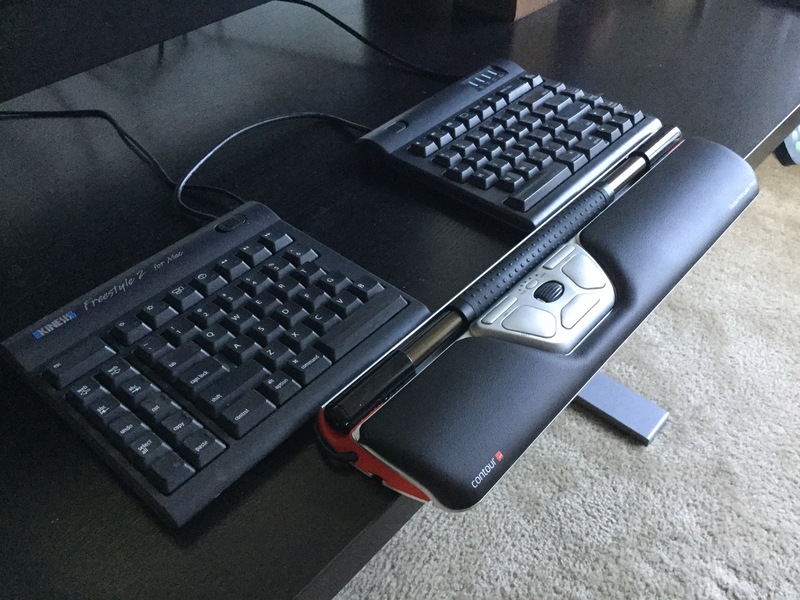 I moved my Kinesis Freestyle 2 (reviewed below) to my office when I got the Ergo Pro. The first few days, my fingers were a bit sore from typing. I got used to it, but eventually, I realized that I did prefer typing at work, and the lower resistance keys, I think, is what did the trick. It’s also buggy. The first keyboard they shipped me would periodically fail such that only G and F on the left side would register. Unplugging and replugging a few times generally fixed it, but when I inquired, Matias was kind enough to send a second version that they’d developed. The problem is that although V2 solved that particular issue (and repositioned a few problematic keys), once every day or two, the keyboard would start pretending that the command key was being held down. Or maybe “s”. Or maybe it’d stop responding altogether. After figuring out that the keyboard was being strange again, you could reach behind the keyboard and unplug it to fix the problem. A quick fix, to be sure, but these are not problems that a $200 keyboard should have. The Ergo Pro isn’t a bad keyboard, by any stretch of the imagination. It has nice switches, it’s well built, and aside from some bugs, works nicely. But, to paraphrase Patrick Rhone’s excellent essay ‘Boring: A review’, well-made tools should eventually become boring. The Ergo Pro never did. There was always something. 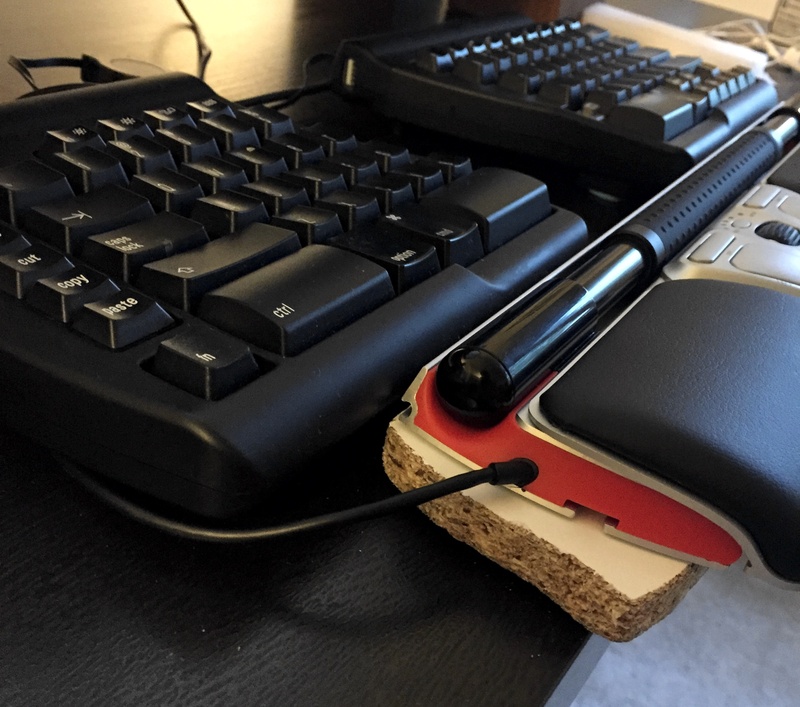 Whether it was a bit of hand soreness, or a bug making me unplug and replug, again, or a key not triggering when it should have, or re-adjusting the riser for the rollermouse because the Ergo Pro shifted, and so on. As an experiment, I recently brought my Kinesis Freestyle 2 home from work, and plugged it in for the weekend in place of the Ergo Pro. And then I forgot about it. It just worked, and I typed, my hands were happy, and I didn’t think about it. It was boring. The Ergo Pro went on sale that night. 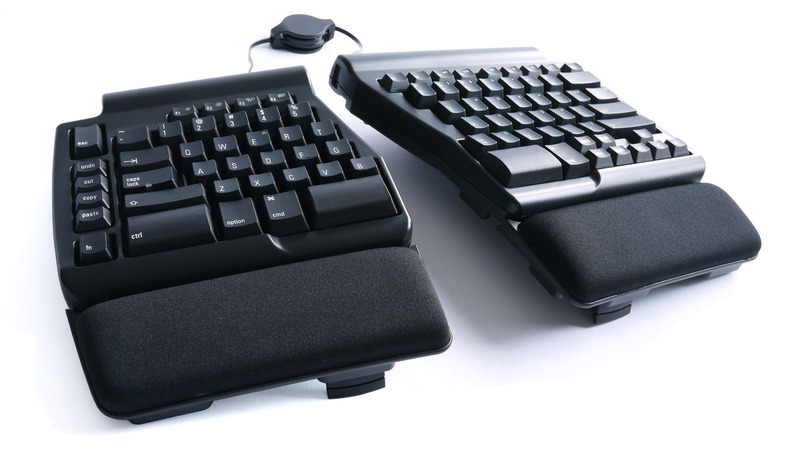 The Ergo Pro is a nice keyboard, which is well designed and excellently built. But the tall form-factor, firm keypresses, and occasional bugs in the hardware make this a losing bet at $200. 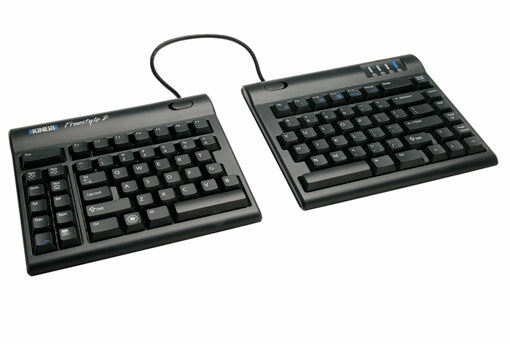 This is a split keyboard with low-resistance rubber-dome switches. It’s the followup to the Kinesis Freestyle that I reviewed back when. The first one was great, and this is greater. It’s thinner than the first version, it’s black (instead of stain-showing white), it feels a bit more sturdy, and there are now hotkeys for things like volume and music control. It’s also the cheapest keyboard discussed here, at only $90 (at the time of writing). This keyboard is great in every way but two. First, the keyfeel. Compared to a mechanical, it’s just not that great. The pressure needed is very low, which is nice. However, the action just doesn’t feel very satisfying. You don’t quite know for sure when you’ve hit the point where the stroke registers. But it’s reliable, and ultimately, boring, so it’s fine. My other issue is very specific: The final column on the right half of the keyboard has “Home”, “End”, “Page Up”, “Page Down” with no space at all between those keys and Delete, , Return. This makes it very easy to mean to hit “Delete” especially when doing so repeatedly or furiously, and accidentally hit “Home”, jumping to the top of your document. This is fine in an email, but a royal pain if you’re on page 155 of your 176 page dissertation. I moved up to the Ergo Pro to try and fix those issues, but realized, only after a few months, that I’d lost more than I gained. The Freestyle 2 is a great ergonomic keyboard. I like this keyboard very much. It’s kind to my body, and it gets out of my way. Its flaws are small, and don’t really cause too much trouble. Put differently, it got me through my 176 page dissertation pain-free. So it must be doing something right. Ultimately, I think the Kinesis Freestyle 2 is the solution for me, and probably for you. I’ll certainly try the next Freestyle, but every time I’ve tried something else, I’ve increased complexity, without increasing benefit. So, if you need an ergonomic keyboard, give the Freestyle 2 a try. It’s got good features, good (but not great) key-feel, and most importantly, it’s easy. It’ll integrate with your desk, with your mouse, and it’ll show you the benefits of a split design. It won’t require you to learn a new layout, or program macros, or prop things up or lower them down. And with all the accessories available, you can do tenting, and raising, and all sorts of other silly things, if you see fit. Instead, if your needs are anything like mine, it’ll sit there, and let you type, and be boring, and just work. And that’s the most important thing any keyboard can do.